I enjoy doing a vacation late in the winter because the scene has noticeably changed by the time I return. When I left for Panama at the end of February, murmurings of spring were starting. The Bewick's Wrens were singing, drake waterfowl were engaging in testosterone-addled rituals, and Anna's Hummingbirds were gathering cattail fluff for nests. I still peeked at the local sightings while I was Panama to see how things were progressing and I read news of Orange-crowned Warblers returning, swallows over Swan Lake, Brant filtering north through the Strait of Georgia, and the start of the herring spawn. I was anxious to get out and see the signs of spring for myself this weekend and I was not disappointed in the slightest. On Saturday, I zipped off for an afternoon jaunt to the tip of Saanichton Spit to see if anything interesting had rolled in during my absence. 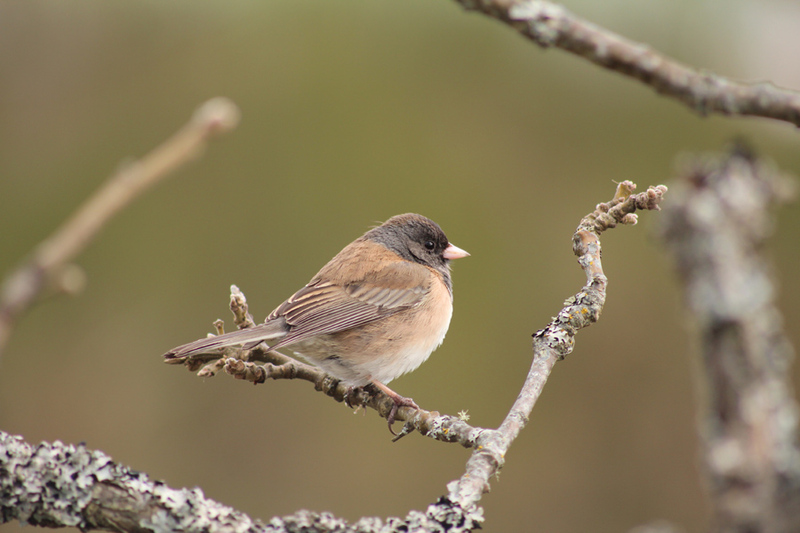 The birding was actually quite slow and most sightings were more representative of winter dragging on than the transition to spring. 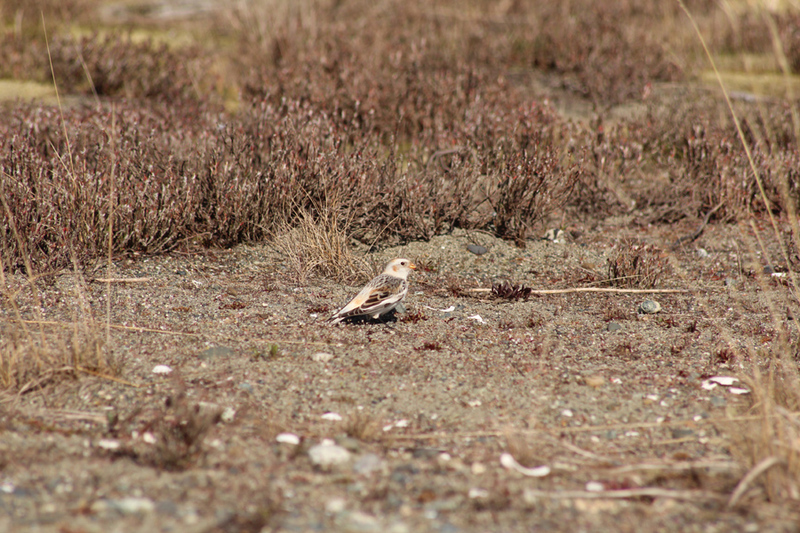 Near the sparse patch of conifers, the long-staying Snow Bunting put in an appearance. It won't be long before it departs for more northerly climes. The group of Western Meadowlarks that overwintered on the spit have their hormone levels shifting into high gear, with multiple males sitting up on logs singing. Meadowlarks bred on Vancouver Island historically, but they have long since been extirpated as a breeding species and we are only able to enjoy their songs for a brief window in late winter and early spring. 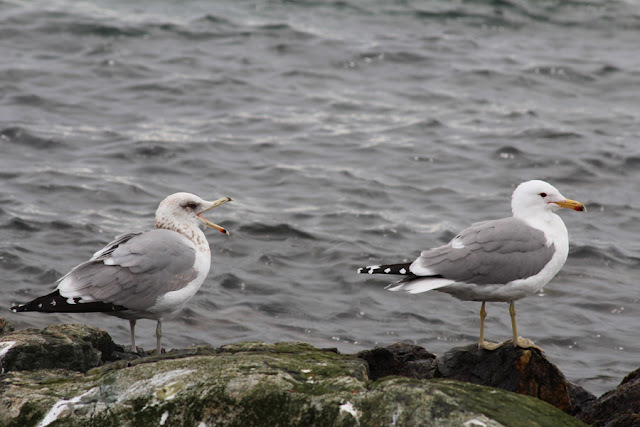 My best harbinger of spring came as I was driving away and gave one last look over the gulls. 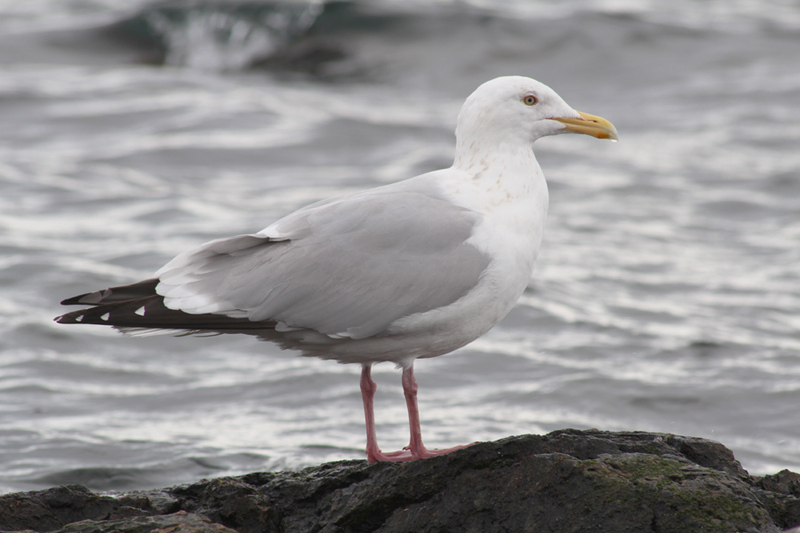 Among the usual assortment, I spotted around ten California Gulls. I enjoy seeing them in the spring as some individuals have a leg colour that is a rather morbid shade of yellow-green, while others show off a radiant set of school bus yellow legs. On Sunday morning, I got in touch with Jeremy K. to see if he was game to continue digging up more spring goodies. He is a good sport and was easily convinced to head out my way so we could start with a pass through the Martindale area, head out to the Victoria waterfront, and then meander our way back. Our morning started rather slowly and we didn't really pick up anything of interest until we reached the Blenkinsop area. Along Lohbrunner Rd., a pale grey spot up in a Garry Oak proved to be a Northern Shrike. A couple minutes later, we passed the Mount Douglas Golf Course and were surprised to find a different Northern Shrike posing atop a small tree. We carried on southeast and punched out to the waterfront at Cattle Point. Normally Cattle Point is rather mundane in terms of gulls, but the scene livens up a little while gulls are on the move up the strait. By bare eye, I could see a couple California Gulls on the water. With the binoculars, several more Californias jumped out of the mix on the rocks as did a couple juvenile Thayer's and a nice adult Herring Gull. 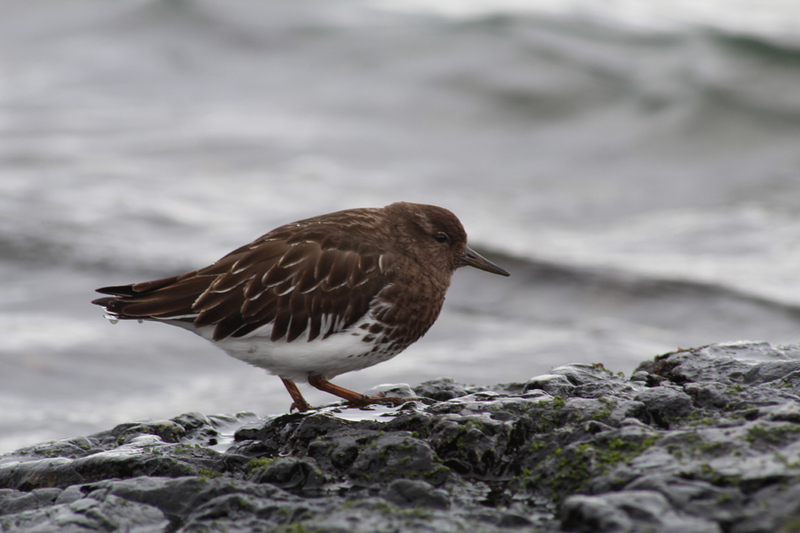 While being nerdy with the gulls, I made sure not to neglect a rather confiding Black Turnstone that edged its way in close enough for a decent shot. Jeremy K. is already getting a little antsy about picking up Redhead for his big year, so we stopped in at Elk Lake to see if one had magically shown up in the last while and avoided detection. His worry is not unfounded as he saw a grand total of two last year - a male and female that made a brief appearance at Viaduct Flats. Aside from that, they were not reported on the Island last year. That background is largely irrelevant because we didn't find one. We were a little stunned to scan out on the lake and see a Red-throated Loon floating in the distance. I decided I would take a miserable record shot, crop it, and present it. Why not? 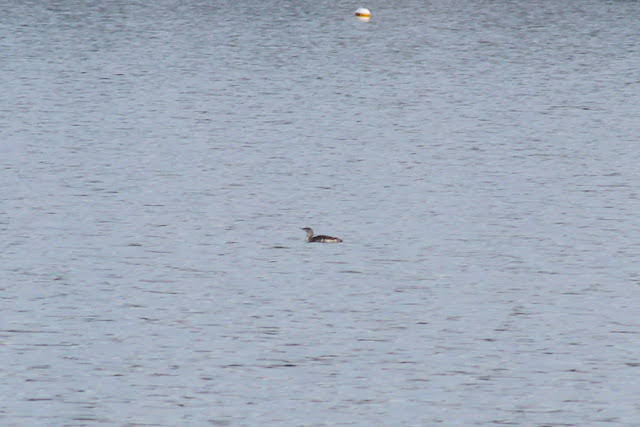 Sasquatch or Red-throated Loon? You make the call! I'll add a couple more shots from the lake for good measure. First, probably one of the more emblematic birds of North America that is definitely taken for granted most of the time. 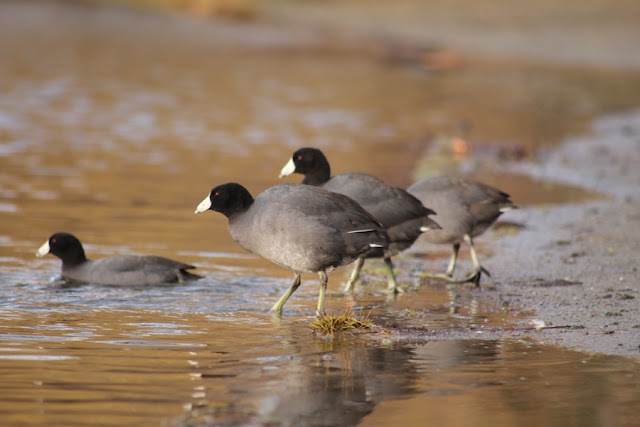 At the Beaver Lake side, we came across a flock of approximately 80 American Coots that looked great in the late sun from the southwest. While scanning out over Elk Lake, I could see a handful of very distant swallows seemingly feeding over the water. We came across perhaps the same group from the Beaver Lake side as they swirled over the conifers at the far end of the lake. We finished our day at the fields along Oldfield Rd. and were once again treated to a group of swallows. Rather than distant views, they made several low passes over the fields and we were able to identify the majority as Violet-greens with a smattering of Trees mixed in. 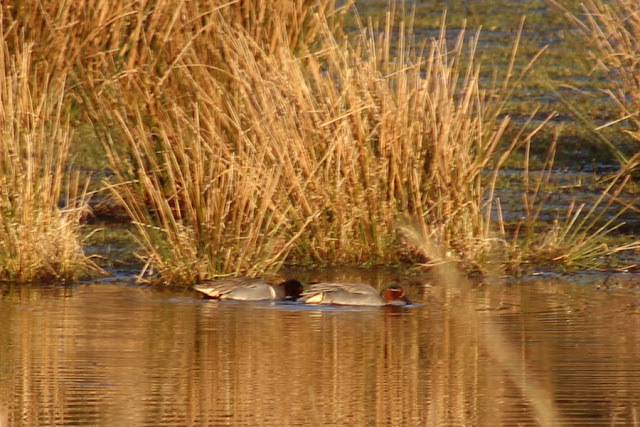 A flooded section hosted a nice selection of ducks, including at least a couple Gadwalls, dozens of American Wigeons and Green-winged Teals, a bird Jeremy K. identified as a female Eurasian Wigeon, and another teal that was either a hybrid Green-winged x Common or pure Common Teal. The bird lacked the white shoulder spur, had an unimpressive white horizontal stripe, but the face had a very pronounced facial pattern. Below, another cryptozoology-style photo shows the bird in question and might even reveal one or two of the aforementioned features. 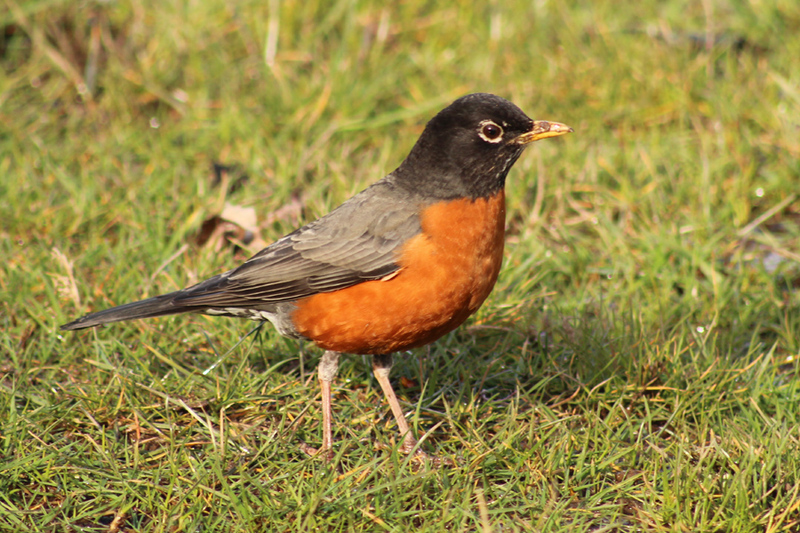 In addition to all the spring bird action, the plants were perhaps even a better indicator of the times. Two flowering shrubs, Indian Plum and Red-flowering Currant, were conspicuous with their flowers in full bloom. With the latter typically synchronous with the arrival of Rufous Hummingbirds, it is only a matter of time before I glimpse a flash of orange followed by the characteristic whir created by their wings. At Harling Point, Bear's-foot Sanicle dotted the grass edge in a fashion that lends itself more to its other common name: Footsteps-of-Spring. Finally, at Mount Douglas the first wave of plants I locally associate with Garry Oak habitats had pushed out some blooms, including Chickweed Monkeyflower, Small-flowered Blue-eyed Mary, and Spring-gold. Regardless of the brief snowy interlude today, I know spring has arrived and I look forward to all that the season brings. Feel free to drop a comment on spring activity you've noted or just your favourite sign of spring.